This year begins my twenty-second year of teaching in the Cedar Rapids area. My students have ranged in age from 3 to 77 and have included beginners to college bound music majors, the concertmaster of the Iowa All State Orchestra, to adults of various levels. My interest in teaching began while observing different teachers as a student at the Cleveland Institute of Music. I began teaching in the CIM Prep Department and enrolled in the Suzuki teacher training program there and was in the first graduating class there to receive the Masters Degree in Violin Performance and Suzuki Pedagogy under the late Michele Higa George. I have registered long term teacher training through the Suzuki Association of the Americas in all 10 Suzuki violin books as part of my degree program. While not all of my additional coursework has been registered with the SAA, I have taken the opportunity to take all of those courses again with other teachers. Currently my main performing instrument is violin but I have also studied viola both in school and at many summer camps. Throughout my college years I usually played and coached in multiple chamber music groups in both violin and viola, and performed in Europe on viola in chamber groups and orchestra. I still perform fairly frequently as a chamber music violist. I have also taught viola for many years. 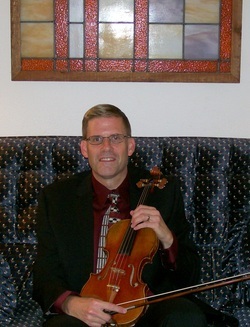 In addition to my private studio I am also an active instructor in the Fifth Grade Fiddles program in the public schools in Cedar Rapids. I currently accept private violin and viola students of all ages in both the Suzuki Method as well as more traditional approaches. The individual program will be tailored to the needs of the student. All lessons are given in a positive and encouraging environment. You can browse the menu for more information. To learn more about my private studio click here.